Are you unhappy with the appearance of your smile? Do you find yourself hiding your teeth when you laugh or smile? Consider your options in dental services at ConfiDenT. We proudly offer custom dental veneers as one of the most innovative and life-changing ways to cover up unwanted flaws and enhance your smile. Whether you have teeth that are chipped, discolored, gapped or crooked, cosmetic veneers can help you gain the smile confidence you deserve. In just two office visits, we can transform your imperfect teeth into the smile you have always wanted. Porcelain dental veneers are wafer thin shells of porcelain that are bonded to the front surface of your teeth. Veneers are considered a purely cosmetic treatment, so they are only used for the visible teeth of your smile. Each veneer is customized in shape, color and form to meet your unique smile goals. Veneers are durable for everyday dental function and are even stain-resistant for long-term beauty. In order for your veneers to strongly adhere to your teeth, a tiny portion of your outer tooth layer must be shaved off prior to placing the veneer. Porcelain veneers are designed to provide a permanent transformation towards a more attractive and younger-looking smile! 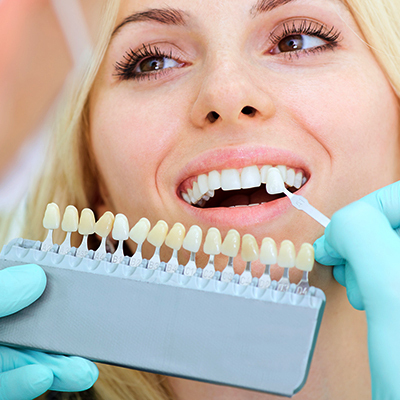 At ConfiDenT, we pursue the latest advancements in cosmetic dentistry. When it comes to veneers, we also offer the following popular types of veneer materials to choose from. Full Zirconia – Zirconia is a type of ceramic material that can be used to fabricate veneers as well as dental crowns. Zirconia is known for its unrivaled strength and durability and can be customized in precise shades and colors. E-Max – E-max, also known as lithium silicate, is also a type of ceramic but this material offers a more translucent quality similar to your natural teeth. However, it may not be best if you have a darker tooth underneath, as E-Max allows more light to shine through. Not sure which type of veneer is best for you? Don’t worry. Based on your unique cosmetic dentistry goals as well as your personal budget and preferences, we can help you determine which material of veneer is most appropriate. Regardless of your choice, you can expect a highly rewarding process from start to finish. At ConfiDenT, we have a team of talented cosmetic dentists who understand the careful blend of science and artistry it takes to create a beautiful and balanced smile. Contact us today to learn how cosmetic dental veneers can give you the smile of your dreams. Whether you are looking to close a large gap between your two front teeth or want veneers for “instant orthodontics,” we are excited to offer this minimally-invasive treatment option to enhance your smile and boost your self-esteem.